GREEN BAY, Wis. — Football coaches tend to speak their own language, inventing words and expressions as they go along. 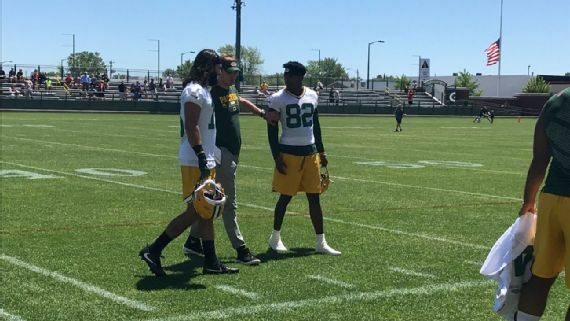 So when Green Bay Packers receivers coach David Raih described rookie J’Mon Moore as someone who “grabs grass,” it was met with some puzzled looks. Even one of the most accomplished receivers in his group admitted that was a new term to him when he came into the NFL. It’s one of the reasons Moore has a chance – perhaps the best chance among the young receivers – to make an impact this season. Beyond the fact Moore was the highest draft pick (fourth round, No. 133 overall) among the three receivers that general manager Brian Gutekunst picked in his first draft this year, Moore appears to have acclimated himself the fastest. Moore made a sideline catch with a high degree of difficulty in this week’s first minicamp practice and has shown the physical attributes that could give him first dibs on some of the snaps now available after the Packers cut Jordy Nelson in the offseason. But back to that grass grabbing. It’s a noteworthy description given the word on Moore coming out of Missouri was the potential lack of breakout speed. He ran a surprisingly slow 40 at the combine; his 4.6-second time ranked behind all but six of the 37 receivers who ran in Indianapolis. Yes, he ran faster (4.48) at his campus workout, but it was a red flag nonetheless. The Packers, however, have not had any issue with his speed. Fellow rookie receivers Marquez Valdes-Scantling (fifth round) and Equanimeous St. Brown (sixth) have made their share of eye-catching plays, too. St. Brown caught a 22-yard touchdown pass against first-round pick Jaire Alexander during one of the 2-minute drills this week right after Valdes-Scantling caught a short out for a first down to keep that drive alive. And then there’s Michael Clark, the 6-foot-6 former college basketball player who spent most of last season on the practice squad before he got his chance late in the season. But Moore might be the most complete combination of size, strength and ability. He has wowed the Packers with his strength, conditioning and athleticism. Of course, none of what Moore has shown this week has come with Aaron Rodgers on the field. Coach Mike McCarthy excused Rodgers and 15 other veterans from the mandatory minicamp because he prefers the final week of the offseason program to be focused on the young players. For Moore – or any receiver – to make his way onto the field come September and beyond, he will have to earn the trust of the quarterback. Previous Previous post: Spanish soccer player draws inspiration from…Michigan basketball?